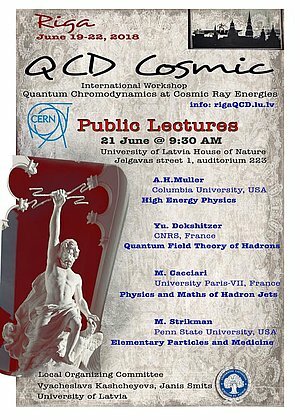 An international workshop “QCD Cosmic” (Quantum Chromodynamics at Cosmic Ray Energies) will take place 18-22 June in Riga, under the auspices of the Physics Department of University of Latvia. This interdisciplinary workshop brings together theorists and experimentalists who study interactions of elementary particles at high energies. On one hand, there are particle accelerators (markedly, CERN Large Hadron Collider) that allow physicists to check interaction dynamics and search for new objects and forms of matter. On the other hand, there is cosmic rays - the source of particles with ultra-high energies that cannot possibly be generated in terrestrial laboratories. Elementary particle physics sets the most challenging quests to mechanical, electrical, computer engineering, material sciences. This results in technological breakthroughs: development of super-fast and resistant microelectronics and superconducting materials, advances in cryogenics, power generation, creation of new medical devices and technologies, the Internet and the notion of Big Data, etc., etc. The workshop "QCD Cosmic" is sponsored by CERN. More information in the poster.